When I first heard someone say, “When I start something I give it 100%”, I got very excited. I thought this was going to be a real go getter. Unfortunately, it is usually followed up with “I’m not ready to to give my 100% yet, I’ll let you know when I’m ready”. So why do these people usually fail to get started? There are two scenarios that play out with this type of person. Either they never get started. They are waiting for the stars to line up so that they can “give it their all”… which will never happen or they do actually get started but after a couple days of ignoring all of their other commitments, family, sleep and food, they burn out and quit. This can be avoided by setting the proper expectations. 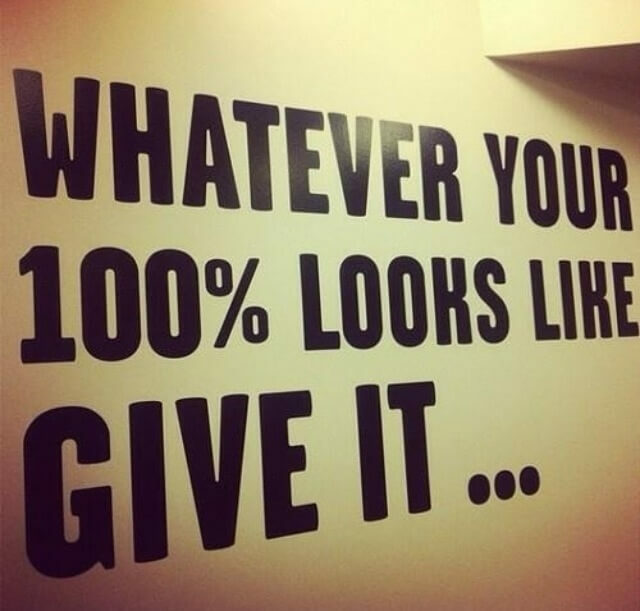 What does it mean to give 100%. First of all, that comment doesn’t even make any logical sense. 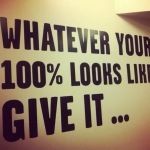 No one can give 100% of their time and effort to any one thing. We all need to sleep, eat, use the washroom, etc. We all need family time, and relaxing time. So right off the bat, either that statement is a lie in order to put off making a decision or it is simply a lot of talk. I think that time, just like money, is a resource. It needs to be budgeted wisely in order to be productive. If you want to start a home business to build an extra income, why not dedicate a few hours a week to your new venture… and then give it 100% during the scheduled time. This means do the activities that are required of you. Every company will have “road map” to success. Take this seriously. The road map is like a recipe for success. If you follow the recipe you can expect similar results… if you change the recipe, you are on your own! Quit waiting for the “right time” and just get started!